In this week’s Compliance Jobs Report: the new head of compliance at Walmart formally takes the reins; a wave of mid-level hires at Unilever, Boehringer Ingelheim, JP Morgan, USAA, and elsewhere. A notable merger happened in the GRC vendor world, we have the usual rundown of interesting job openings, and we note the passing of the top auditor in Canada. First, as of this month. Dan Trujillo formally takes over as global head of compliance for Walmart. He replaces Jay Jorgensen, great guy, who ran Walmart’s compliance function from 2012 to 2018. Jorgensen announced his departure late last year. Still waiting on what his next move might be. Trujillo has been with Walmart since 2012. Speaking of Walmart, Jennifer Buchanan just landed a new role there as senior director of learning and talent for the Sam’s Club division. Buchanan previously worked as senior director of international ethics and compliance training for Walmart since 2015. The University of Southern California (go Trojans!) has tapped Stacy Giwa as vice president of ethics and compliance. Giwa previously spent five years at EY in its forensics and integrity practice, and prior to that spent several years as chief ethics and compliance officer at Southern California Edison. IFPMA, a global association of pharmaceutical research companies whose acronym I can’t quite decipher, has promoted Sofie Melis to head of ethics and compliance. Melis had been IFPMA’s senior manager of ethics and compliance for three years. In Stamford, Conn., Alexis Stroud just landed a job as director of ethics and compliance at pharmaceutical company Boehringer Ingelheim. (So maybe Boehringer is a member of IFPMA?) Stroud comes to Boehringer from Purdue Pharma, where she had been director of ethics and compliance since 2015. Insurance firm USAA has hired Ned Glenn as assistant vice president for enterprise anti-bribery and corruption. Glenn previously worked at HSBC as head of audit and issues management for the bank’s US financial crimes compliance team. Jason Pelletier has a new role at JP Morgan Chase: executive director of firmwide risk management. Pelletier had been global control manager for firmwide risk since 2015 and has been in various internal control jobs at the bank since 2009. He’s based in Orlando. The University of West Florida has named John “Vito” Hite associate vice president and chief audit executive. Most recently Hite was director of internal audit services for Contra Costa Community College District in California. Elizabeth Jobes is the new chief compliance officer for EMD Serono’s North American operations. EMD Serono subsidiary of Merck & Co., and Jobes will serve as part of Merck’s global healthcare compliance team led by Betania Glorio. Jobes has not yet updated her LinkedIn page, which still lists her at her previous job with Spark Therapeutics. D’oh! Unilever has named Carolina Moncalier its business integrity officer for the southern cone of South America; she’s based in Argentina. Most recently Moncalier has been getting her MBA, but earlier in her career she spent nine years at Walmart in various ethics and compliance roles for its Latin America operations. Commerce Bancshares, based in Kansas City, Mo., has given Lynn Tankesley a new role as chief risk officer. She’ll focus on regulatory compliance, investigations, data governance, and third-party risk, among other duties. Tankesley has been with the bank for 26 years. Ian Moolman has a new job as compliance manager at Allport Cargo Services in London. He previously spent nine years at Glencore in various compliance roles. Visions Federal Credit Union, based in Endwell, N.Y., has named Darla Huff vice president of enterprise risk management. She previously was senior director of operational risk management at Columbia Threadneedle Investments in Minnesota. Resideo, a home technology business spun out of Honeywell and taken public last fall, has hired Domenick Claudio as internal audit manager. Claudio was last seen at Estee Lauder, where he ran global financial compliance for the company for 10 years. Stephen Rees is celebrating one year as chief compliance officer for New Age (African Global Energy) Ltd., a holding company for oil & gas investments in Africa. Valerie Workman is celebrating one year as associate general counsel for compliance at Tesla. And we mourn the passing of Michael Ferguson, auditor general of Canada, who died on Feb. 2 at the age of 60. Ferguson had been the Canadian government’s top auditor since 2011. He was suffering from cancer. A good auditor. Big news among the compliance vendors: ACL, purveyor of audit and risk management software for years, has acquired RSAM, a software vendor with a focus more on security and vendor risk management. Purchase price was not disclosed, but the deal does follow a $50 million investment round ACL raised last year — further proof that significant money is pouring into the vendors, and those deep pockets expect the vendors to expand with new products, new geographic territory, and acquisition. Caseware has rebranded its AML compliance and controls monitoring software from Caseware Monitor to Alessa. Not sure I see the wisdom in that, since the original name told you what the product does and the new name sounds like a vacation spot in the Adriatic. Investigations firm Kroll has named two new managing directors, Terry Orr and Michael Schwartz, for its practices in Dallas and Houston, respectively. Aetna (health insurance) is looking for a chief international compliance officer. Job is in London. Akorn (medical devices) is recruiting a chief ethics and compliance officer. Job is in Chicago. And for the daring, the Maniilaq Association (community healthcare) is seeking a chief compliance officer. Job is in Kotzebue, Alaska— 33 miles north of the Arctic Circle, on Alaska’s northwest coast. 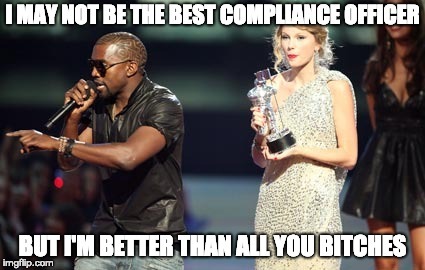 This week’s meme comes from an anonymous regional compliance officer, who received this nice vote of confidence from the global CCO after some resistance from other employees. That’s all for the week ending Feb. 8. As always — if you have a tip or want to brag about your new job, promotion, career milestone, or anything else, email me at [email protected] or find me on LinkedIn. I’m always happy to give credit to the many hard-working people here in our corner of the business universe.